Jesus was uniquely adept in the art of "reading" people. He fit his approach to the precise needs and interests of the person with whom he was dealing, and he spoke the cultural language of that individual. In this book, Robert Perry takes what Jesus and others have done intuitively--niche marketing--and provides a system for applying those principles in everyday practice. Convinced that congregations can learn from the wisdom of secular disciplines and apply that wisdom to congregational life, without damaging the integrity of the Christian faith, Perry offers a detailed process for using sound marketing principles to identify a congregation's strengths and the needs of its community, and to develop strategies for effective ministry. Perry's plan: to create a common vocabulary that will bridge the communication gap between the disciplines of business marketing and congregational outreach strategizing. The key: to keep in mind the reason we are working to reach people--not to make money for shareholders, but to share the Good News that God loves us. The goal: to foster genuinely healthy, growing congregations! 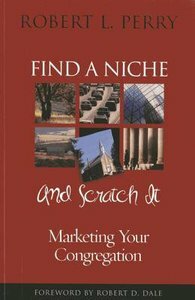 About "Find a Niche and Scratch It"